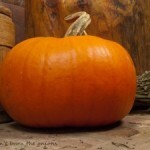 I adore pumpkins but in the UK they only seem to be available for a short time during the Halloween period. Then, just like the witches, ghosts and ghouls they vanish again until the following year! So when pumpkins make their annual appearance, I always buy as many as I can possibly store, hoping to make them last as long as possible! There are lots of great pumpkin recipes; maybe it’s because the soft flesh easily lends itself to be cooked to a smooth, velvety pureé, perfect for savoury soups or sweet pastries. 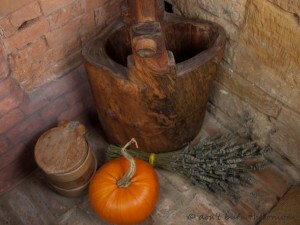 Pumpkins are used widely in Mediterranean cooking for soups and rustic bean and vegetable stews, such as Minestra , which you can find in an earlier post. What I like about pumpkins is not just their sweet flavour but the way the flesh dissolves as it cooks, acting as a natural and nutritious thickener. And of course their pips make a delicious toasted soup topping or snack. I created this soup recipe on Sunday, using many of my favourite Mediterranean ingredients such as cumin, almonds and fresh rosemary. 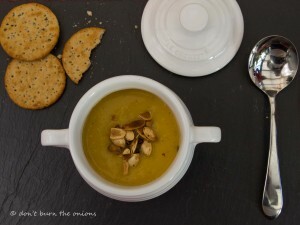 The result was a spicey, warming soup topped with rosemary and pink pepper flavoured pumpkin seeds. Perfect now that the weather’s turned a little chilly! 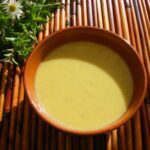 By baking the pumpkin, the soup will taste richer but it can just as easily be made without this extra step. Simply add the pumpkin to the pan at the same time as you cook the rest of the vegetables. Soup (serves 8) You will need a large, heavy bottomed pan for the quantities given here. 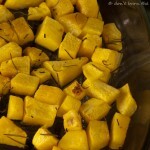 Toss pumpkin in a little olive oil, add rosemary and salt and place in oven proof dish. Bake in oven for about 15 minutes or until the cubes are soft and lightly caramelised. 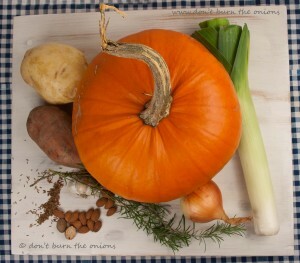 Whilst pumpkin baking, peel wash and chop rest of vegetables and garlic into medium-sized chunks. Heat tablespoon of oil in a large pan and add the vegetables and garlic, stirring to make sure they do not burn. Add baked pumpkin and rosemary to the pan and cook until all vegetables are soft. Then liquidise until it turns to a creamy consistency. Your soup is now ready to eat-unless you wish to add the pumpkin seed garnish in which case read on! Wash pumpkin seeds and remove all stringy membranes. Shake dry. Place in a pan of lightly, salted water and bring to the boil. Simmer for about 10 minutes. Remove from pan, sieve and pat dry. Toss in a little olive oil, add freshly chopped rosemary, crushed pink pepper corns and salt. Mix well and spread out evenly on a baking tray. Roast in hot oven (about 300F) for about 10 minutes. Take out and move them around to make sure they cook evenly. Then return to oven for a further 8-10 minutes. Check whether just about cooked and add almonds for about 1 more minute. Bake until light brown turning frequently to stop almonds burning. Once cooked remove from oven and allow to cool before sprinkling on soup. The rest can be eaten as a healthy snack! 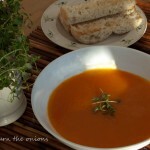 This entry was posted in Soups & Sauces by dontburntheonions. Bookmark the permalink.